This post is sponsored by The Libman Company but the content and opinions expressed here are my own, as usual. - Monday: Mondays are laundry day. All laundry. All on one day - I like to just get it over with and this way it feels like there's actually an END to the laundry. -Tuesday: I vacuum the carpets, rugs and wood floors. With an almost 3-year-old and almost 1-year-old, our floors get so ridiculously messy. Not to mention, the almost 1-year-old LOVES to find every tiny (or large) speck and put it directly in her mouth rolls eyes. So ready for THAT stage to be over hah. I also try to lightly mop the laminate wood floors - milk spills, cooking spills, you name it. 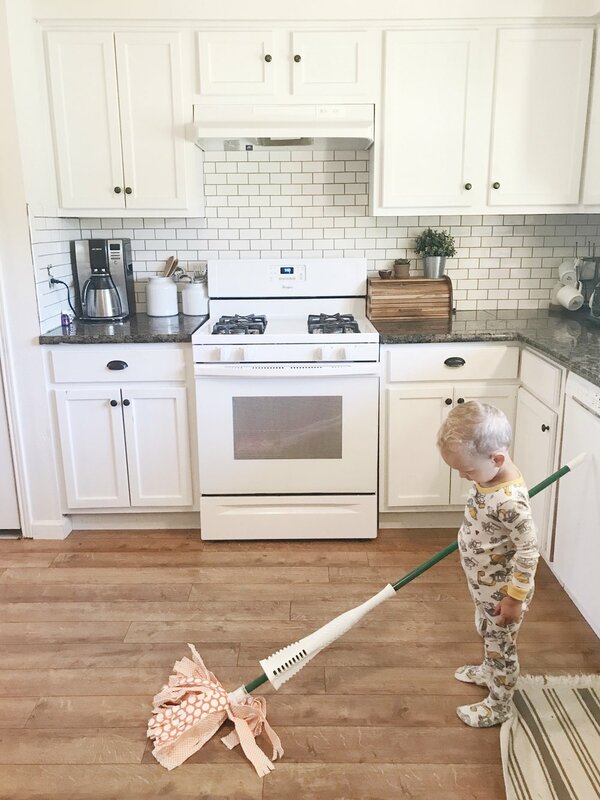 Our favorite mop is the Libman Wonder Mop (gets those floors squeaky clean) and is so easy to use - which is a huge plus when you have a toddler begging to help! I want to encourage him to serve and have a helpful heart as much as possible, so I love including him. We bought our Libman Wonder Mop at Target but they are also available at Lowes, Walmart and Home Depot. - Friday: On Fridays, I try to do something like clean out the car (HOW DOES SO MUCH CRAP ACCUMULATE IN LESS THAN A WEEK?! ), vacuum the car, declutter the kitchen table (which also accumulates enormous amounts of crap), etc. Clutter and messes seriously stress me out, so our house is decently clean most of the time simply because of that. We try to wipe the kitchen counters down, put toys away, load the dishwasher, etc every night after the kids go to bed (coming out to a dirty house in the morning just starts my day off on the wrong note). But anyways, all that to say, Mondays and Tuesdays are my major days for other stuffs. And it helps me not to feel like I'm cleaning nonstop all week! -Mopping (as long as it's not too wet, he does a great job! And I love how easy it is for him to use the Libman Wonder Mop). It's lightweight AND I can toss the head in the washer - how stinkin' easy is that. - Helping me cook (we use his Little Partners kitchen tower and he loves to help stir and bake and saute. My fave). Anyways, I hope that's insightful or helpful to someone out there! What does your family do? Do you have a cleaning schedule? What are some of your favorite products? PS - you can sign up here for The Libman Company's newsletter to get a $3 off coupon for a Wonder Mop of your own! Click here to enter a sweepstakes (where 20 people will win a Libman prize package comprised of some of your favorite Libman products)!